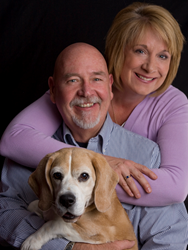 Liz Friedlander, of RE/MAX of Boulder, to exhibit two Beagles at Boulder County Fairgrounds dog show. “I got my first Beagle, Ginger, back in 1985 and fell in love with the breed. My journey with this breed has now spanned almost 29 years. The true purpose of “conformation,” the official name for “dog shows,” is to evaluate breeding stock. A dog’s conformation, its overall appearance and structure, is an indication of the dog’s ability to produce quality purebred puppies, which is what is being judged in the ring. Liz, who judged the National Beagle Club of America show in Tucson, AZ, in 2013 and has been chosen to judge the Beagle Club of New South Wales in Sydney, Australia, in April 2017, is a lifetime member of the Flatirons Kennel Club. While most of her time is spent in conformation, she and her dogs also enjoy participating in rally and agility just for fun. About Liz Friedlander, RE/MAX of Boulder, Inc.
Liz Friedlander and husband Barry, of RE/MAX of Boulder, are Certified Distressed Property Experts (CDPE), Certified Residential Specialists (CRS), Accredited Buyer Representatives (ABR), and Eco-Brokers. RE/MAX of Boulder is nationally recognized as one of the most successful real estate firms in the business and was named the No. 1 RE/MAX office in the country from 2007 to 2012. For more information, please call (303) 416-5939, or visit the office at 2425 Canyon Blvd., Suite 110, Boulder, CO 80302.